The Middle East showcase solid growth rate globally, overall cosmetic industry growth is promising related to historic period. Luxury cosmetic product market growth is majorly driven by rich, young and aspirational population who want to invest in grooming, getting attractive appearance and maintaining their health in the process. According to Goldstein Research, the share of luxury cosmetic products in Saudi Arabia would grow from 54% 2017 of the market to 60% in 2020, with the UAE’s premium cosmetic products market share increasing from 48% to 50% in the same period. Local premium cosmetic brands have seen excellent growth over the past few years. For instance, Arabian Oud witnessed a +170% increase in sales between 2010 and 2015, making it the fifth best-selling brand in the Middle East region. Goldstein Research analyst forecast the Middle East luxury cosmetics market to expand at a CAGR of 8.6% during the forecast period 2017-2025. Moreover, the market is projected to reach USD 14.3 Billion by 2025 owing to growing per capita spending over premium cosmetic products. The report covers the present ground scenario and the future growth prospects luxury cosmetics market for 2017-2025 along with the total revenue of luxury cosmetics industry in every country. We calculated the market size and revenue share on the basis of revenue generated per segment, region and country level. The revenue forecast is given on the basis of number of cosmetic product manufacturers and current growth rate of the market. Based on product type, premium fragrances and perfume accounted for the lion market share of more than 60% of Middle East luxury cosmetics market followed by skin care products in 2017. Further, the skin care products are expected to be the fastest growing segment at a CAGR of +16% during the forecast period. Middle East Luxury Cosmetics Market Outlook 2017-2025, has been prepared based on an in-depth market analysis from industry experts. 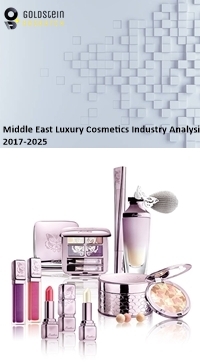 The report covers the competitive landscape and current position of major players in the Middle East luxury cosmetics market. The report also includes porter’s five force model, SWOT analysis, company profiling, business strategies of market players and their business models. Middle East luxury cosmetics market report also recognizes value chain analysis to understand the cost differentiation to provide competitive advantage to the existing and new entry players. Our Middle East Luxury Cosmetics market report comprises of the following companies as the key players in the Middle East luxury cosmetics market: L’ORÉAL, SHISEIDO, UNILEVER, ESTÉE LAUDER, PROCTER & GAMBLE, LVMH, Coty, Chanel, Dior, Guerlain, Clarins, Clinique, Lancôme, Beiersdorf, MAC, Revlon and Avon Products. According to our Middle East luxury cosmetics market study on the basis of extensive primary and secondary research, one major trend in the market is growing knowledgeable and inquisitive consumer population in Middle East. As verified by the vast demand for designer brand sales in UAE, consumers now pay more attention to worth, rather than just the brand or product itself. According to the report, major driver in Middle East luxury cosmetics market is high disposable income of people in the region especially in GCC countries, where countries such as UAE and Saudi Arabia having the largest population and considerable number of tourists significantly augmented the growth of luxury cosmetic industry in the region. Moreover, rapid urbanization and growth of shopping centers and malls played an essential role in changes of shopping habits in these developing countries. Further, the report states that one challenge in Middle East luxury cosmetics market is luxury brand awareness. Full physical flagship store expansion by luxury brands is based on their brand awareness paradigm which is essential to have stores to strengthen their contact with customers and increase brand awareness. Geographically, Kingdom of Saudi Arabia accounted for the largest market share of more than 35% of Middle East luxury cosmetics market in 2017.In Middle East GCC countries are fastest growing markets for luxury cosmetic products owing to highest per capita spending over cosmetic products.